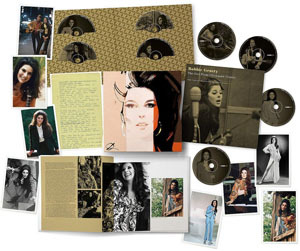 Share the post "Album review: BOBBIE GENTRY – The Girl From Chickasaw County (Box set)"
It’s always frustrating when a ‘definitive’ box set promo amounts to a couple of discs of largely alternative versions, demos, and live recordings. In other words, a handful of album tracks and, in this case, a selection of the 75 unreleased recordings that make this package worthy of the ‘deluxe’ branding. The set is subtitled The Complete Capital Masters, so the ‘meat’ of the release is Gentry’s six studio albums for the label – released between 1968 and 1971 – and her 1968 collaboration album with Glen Campbell all remastered from the original tapes. The ‘extras’ include her ‘lost’, unreleased, jazz album, outtakes, demos, rarities, and an 8th disc of live performances from her late sixties BBC TV series. On top of that, for your £70, you get an 84 page booklet, 8 postcards, and a facsimile of her original handwritten ‘Ode To Billie Joe’ lyrics. I’ll confess that while the latter song is probably in my list of all-time favourites, and I probably did see some of her TV series (if for no other reason than Pan’s People regularly guested), I know relatively little of her wider recording career. ‘Country’ just wasn’t a genre that excited me in my formative years. Although it’s interesting, looking back, to learn Gentry was one of first female musicians to write, produce and publish her own music, to produce her own stage shows via her own production company, and the first female singer songwriter to be given her own BBC TV series. And, while I’m becoming increasingly sceptical of some ‘remastering’, one thing’s for certain – ‘Ode To Billie Joe’ has never sounded sweeter than it does here. And as regards the ‘extras’ available on the promo discs, they’re what you might expect – a mixed bag. The breadth of styles covered is surprising, as is the quality of her singing (Karen Carpenter springing to mind on a number of occasions). This entry was posted in ALBUM REVIEWS, ALBUM REVIEWS (Mobile), All Posts, Reissues and tagged Bobbie Gentry, box set, country, Glenn Campbell, pop, review, singer, songwriter, The Girl From Chickasaw Country. Bookmark the permalink.